Ricardo contacted me to write and review a recipe from their holiday recipes. After looking at all the various recipes, my husband and I narrowed the recipe list down to a few. 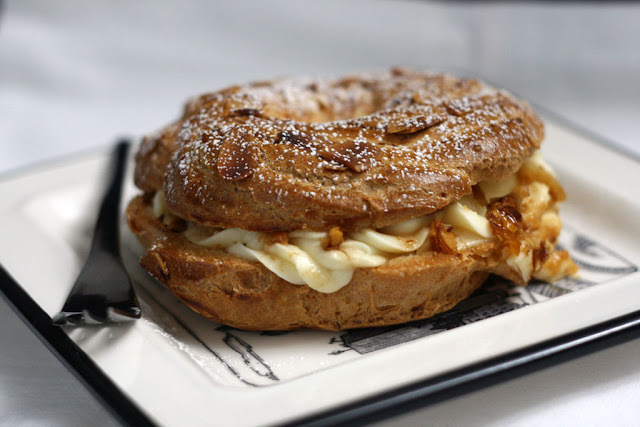 I ended up choosing the Paris Brest mainly because it is one of our favourite pastries to get at our local bakery and I have always wanted to know how to make them. Paris Brests originate from France where a baker created this pastry in 1910 to honour the bike race that occurred from Paris to Brest! The Paris Brests itself resembles that of a wheel. At first the Paris Brest recipe may seem daunting, but the recipe is split into four stages which makes it easier to follow. Here are some photos and notes from my experience of baking the Paris Brest using Ricardo's recipe. I made one substitution; using vanilla extract instead of the amaretto. 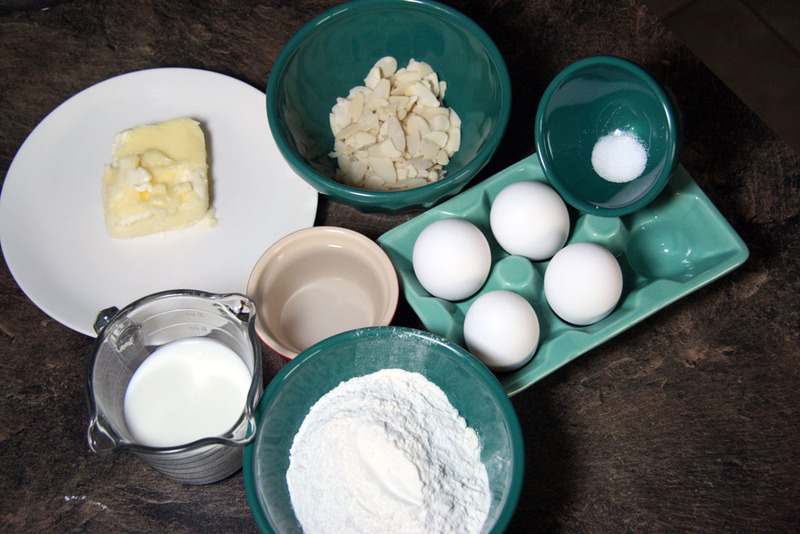 I find that gathering all the ingredients together for each step helps to keep me organized. 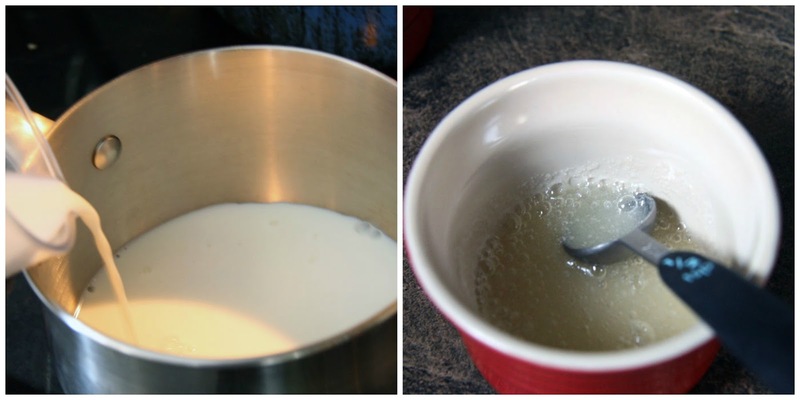 First, heat the milk in a heavy bottom pot on the stove and bloom the gelatin (by adding the gelatin to water). 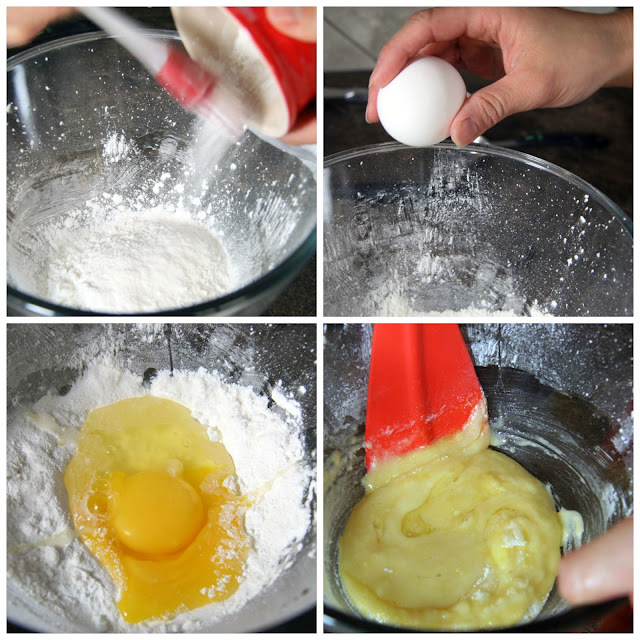 Next, add the egg yolk and egg to the dry ingredients. 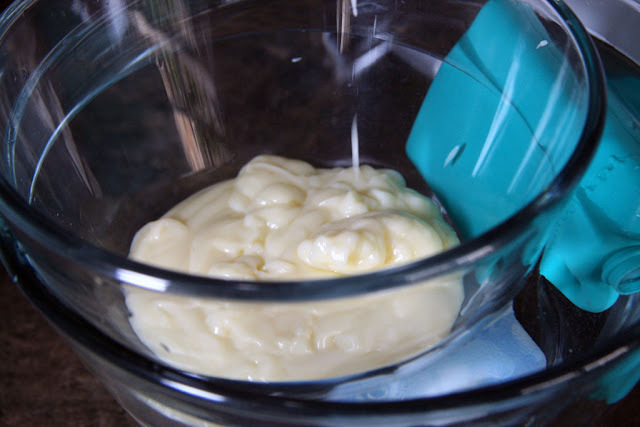 Using a spatula mix until smooth. It should resemble that of a pudding consistency. 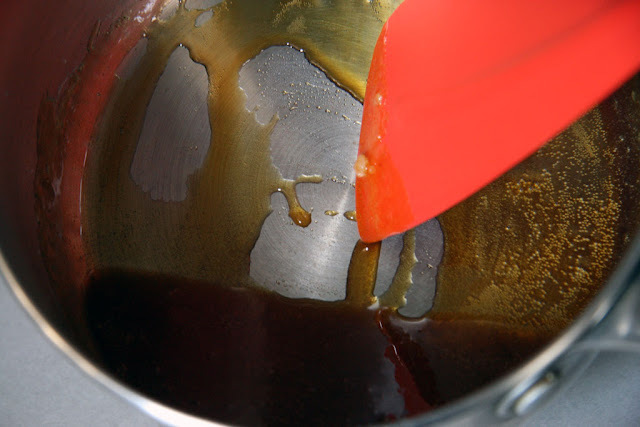 Once the mixture is smooth, whisk in the hot milk and almond extract (or Amaretto). 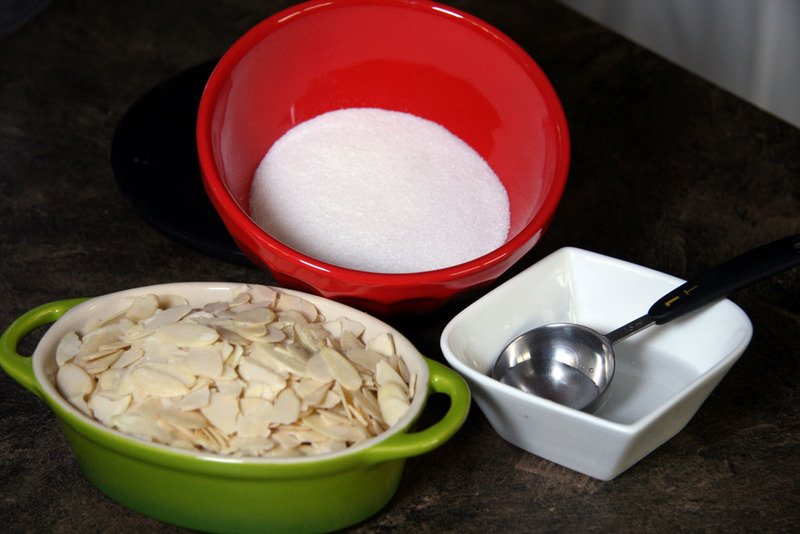 Once the milk and almond extract is incorporated, transfer the mixture back to the heavy bottom pot and bring to a boil. 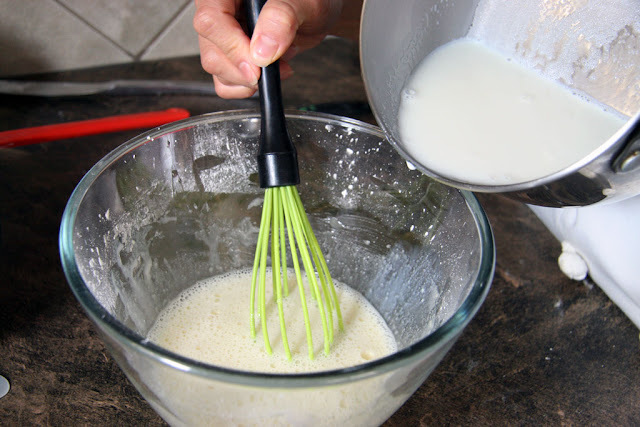 Keep whisking the mixture as you heat and you will see the mixture thicken to a cake batter consistency. 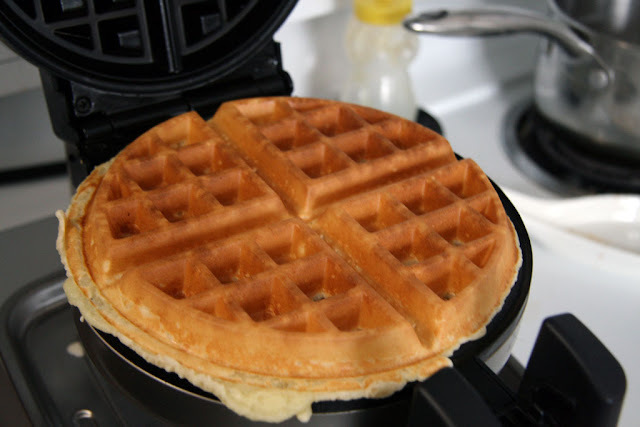 At this point you make see chunks of batter. Don't worry and keep whisking as it will start to smooth out. Turn down the heat, add in the gelatin and stir to combine. Once the gelatin is combined, place the cream in an ice water bath. I didn't have any ice cubes on hand so I made an ice bath with water and some ice packs. I also transferred the cream to a smaller glass bowl that could sit inside the bigger ice bath bowl (as below). 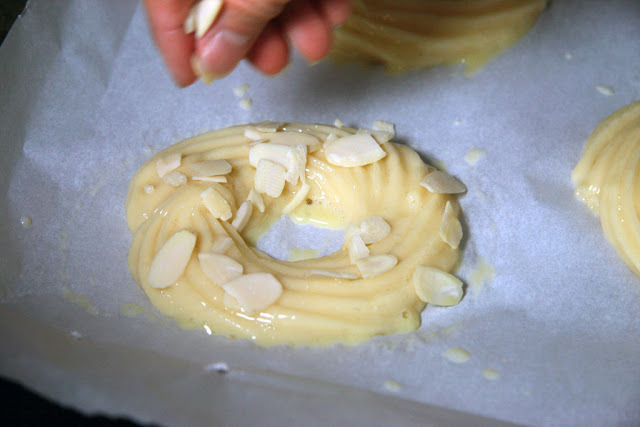 Keep the cream in the ice bath and occasionally whisk the cream while prepping the other parts of the Paris Brest. 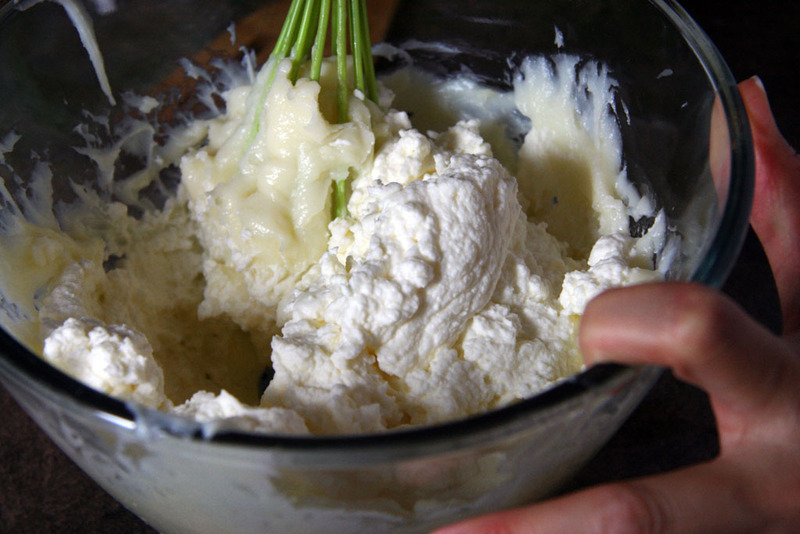 It will get really thick and chunky as the cream cools. Once the cream is at room temperature, whip the whipping cream in a stand mixer (or hand mixer). 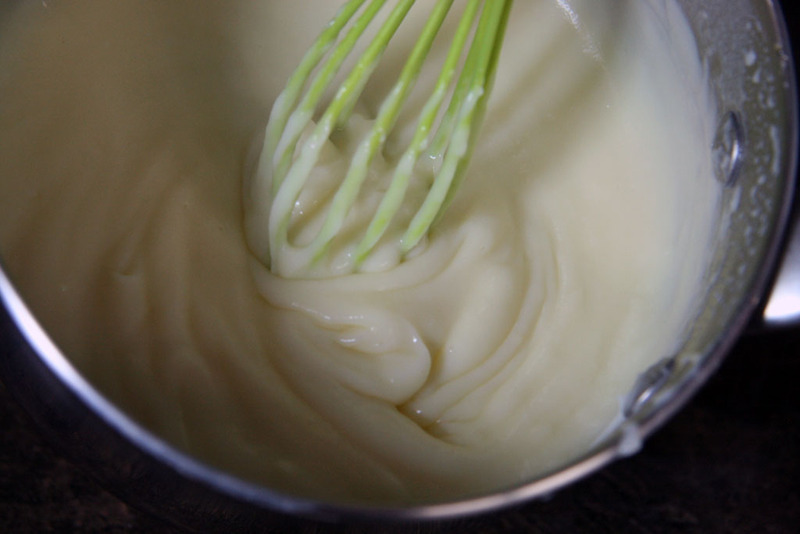 Then, slowly stir in the whipping cream to the cooled cream filling. At this point, cover the cream filling with plastic wrap and place it into the fridge to cool further prior to piping. The next item to prep was the praline almonds. I initially followed the steps listed in Ricardo's recipe for making the praline almonds. 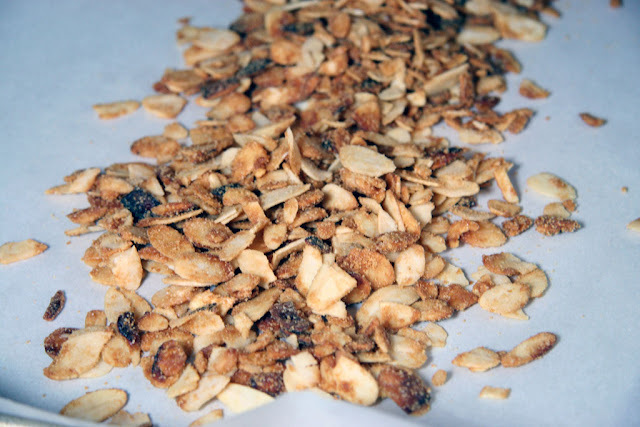 However, the sugar didn't caramelize the way I expected it to and some of my almond pieces started to burn. I used the same amount of ingredients as listed but changed the steps. 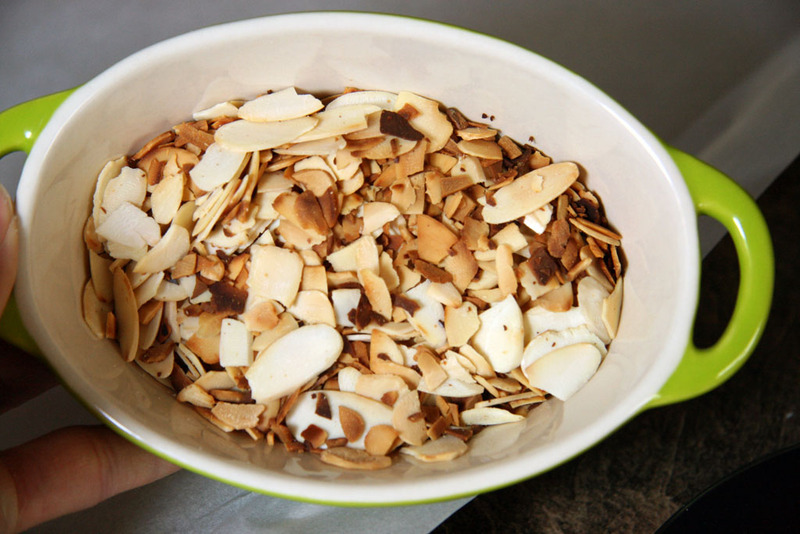 First, toast the almond slices in a dry pot. 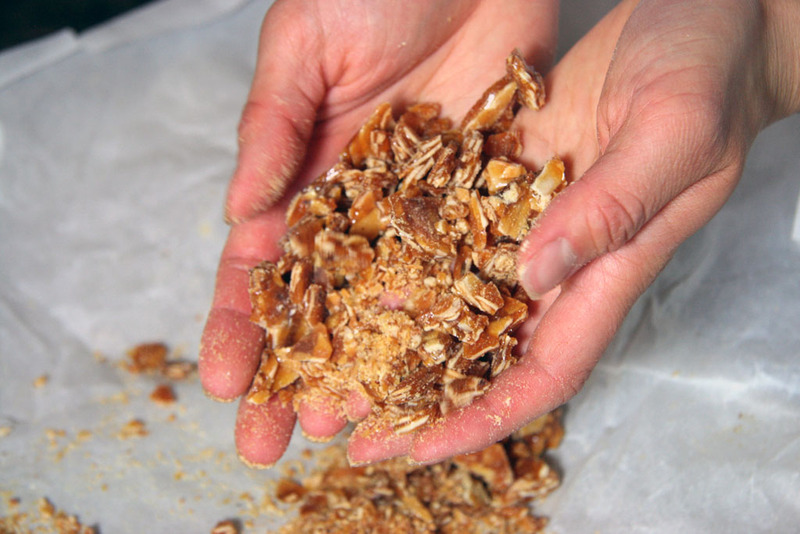 Swirl the almonds around occasionally. This helps to evenly brown the almond slices. Then, heat the sugar and water in the pot. Try not to touch the mixture as it heats. You will see the sugar start to crystallize. Once it crystallizes it will begin to melt and form a dark amber colour (similar to that of maple syrup). Working quickly, mix in the toasted almonds until the sugar coats the almond slices. Then immediately spread the mixture onto a baking pan lined with parchment paper. Set the pan aside to cool. Again, measure all the ingredients that you need for making the choux pastry. First, preheat the oven to 375F (190C). 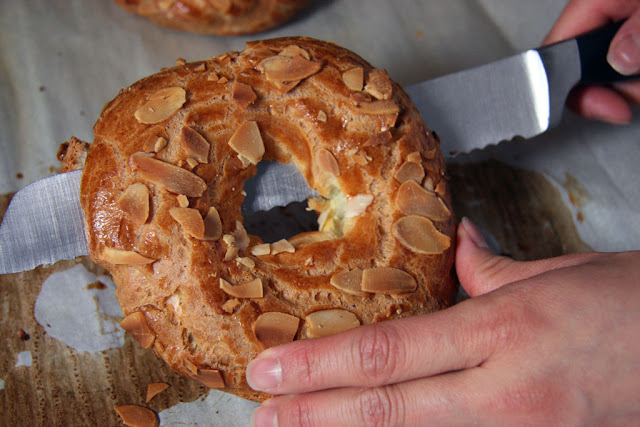 The original recipe calls for making one big Paris Brest (20 cm, 8 inches). However, since I didn't want one big Paris Brest, I decided to make some smaller ones. That way, I could easily share my creations with others too! 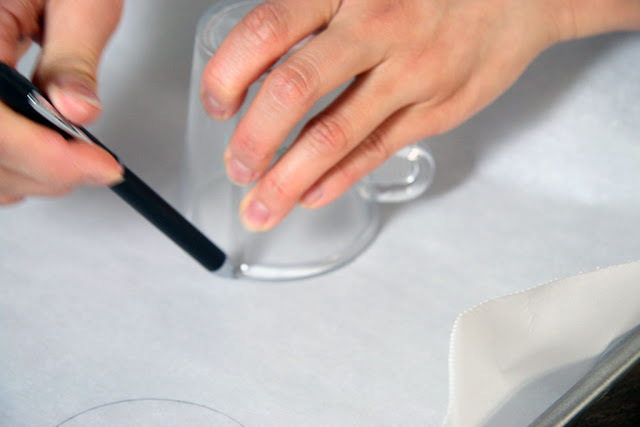 Line a baking tray with parchment paper and make a template by drawing 5, 3 inch circles onto the parchment paper. Spacing them about 2 inches apart is best. 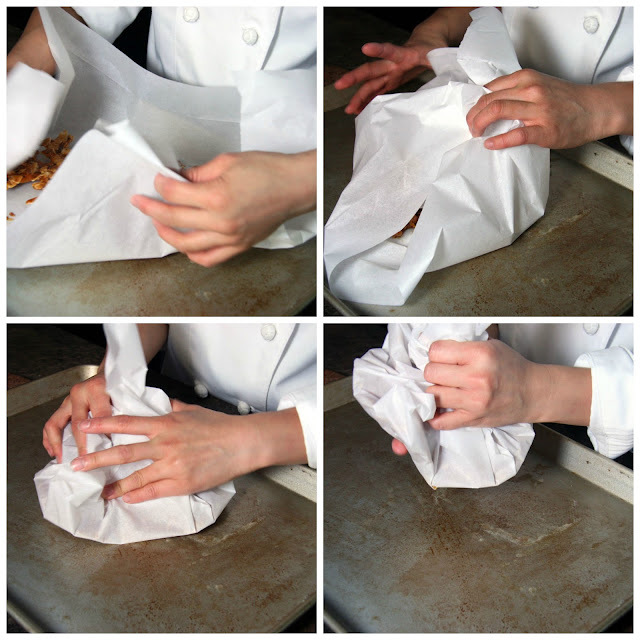 Then flip the parchment paper over. You want to be piping your Paris Brests on the side where there isn't any pencil/pen. 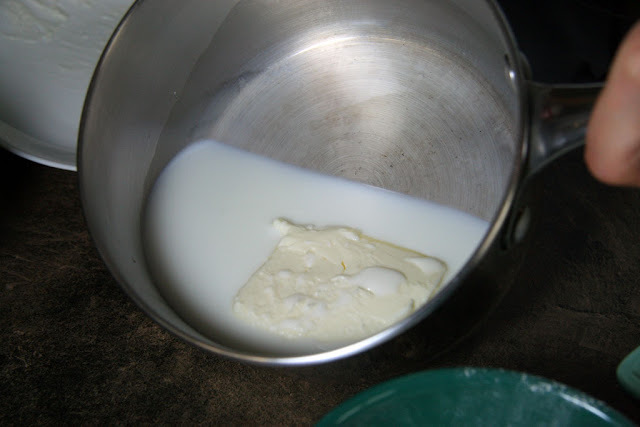 In a heavy bottom pan bring water, milk, butter, and salt to a boil. Place the lid on the pot as this helps to prevent evaporation. Remove the pot from the heat and all all the flour at once. 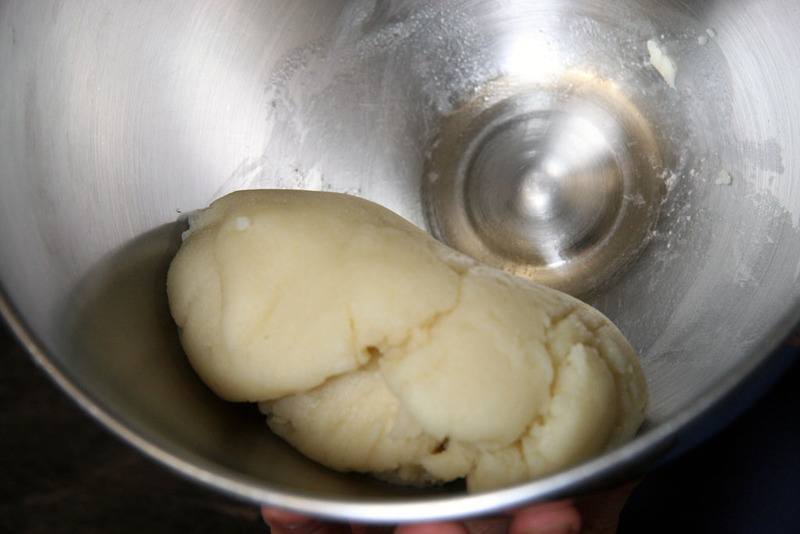 With a wooden spoon, quickly stir until a ball of dough forms and it begins to pull away from the bowl. Return the pot to the stove and heat at low heat for a few more minutes. Transfer the ball of dough to the bowl of a stand up mixer and allow it to cool for a minute. 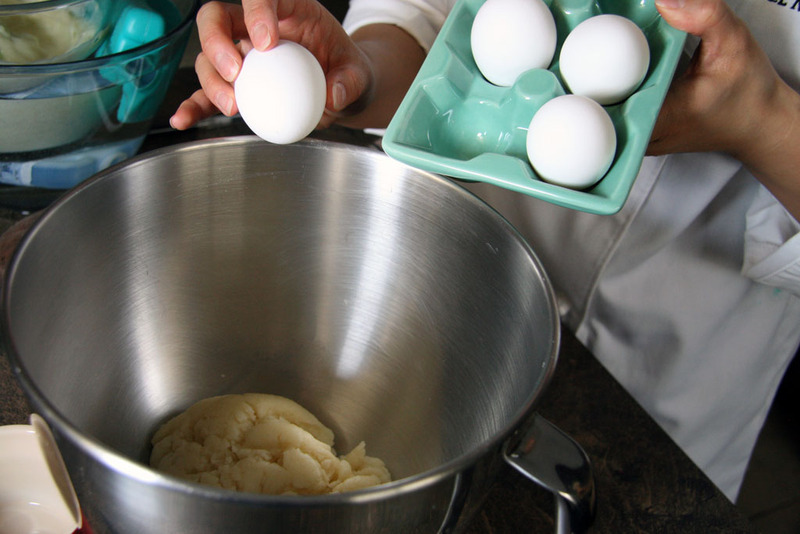 Turn the stand-up mixer to a low speed and slowly add eggs one at a time. Ensure that the eggs mix well between each addition. Transfer the choux pastry into a piping bag. 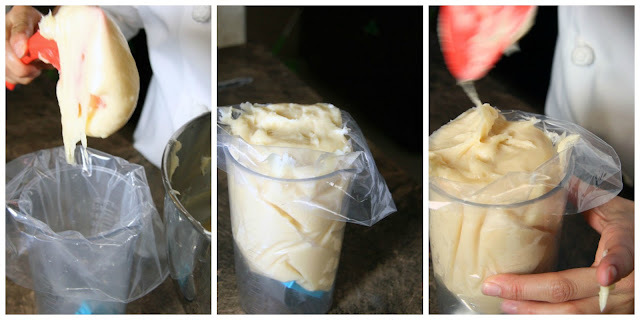 Use a small upright container (or a tall cup) to hold up the piping bag to make the transfer of the choux pastry easier. I used a star piping tip for these ones, but you can use any type of piping tip. 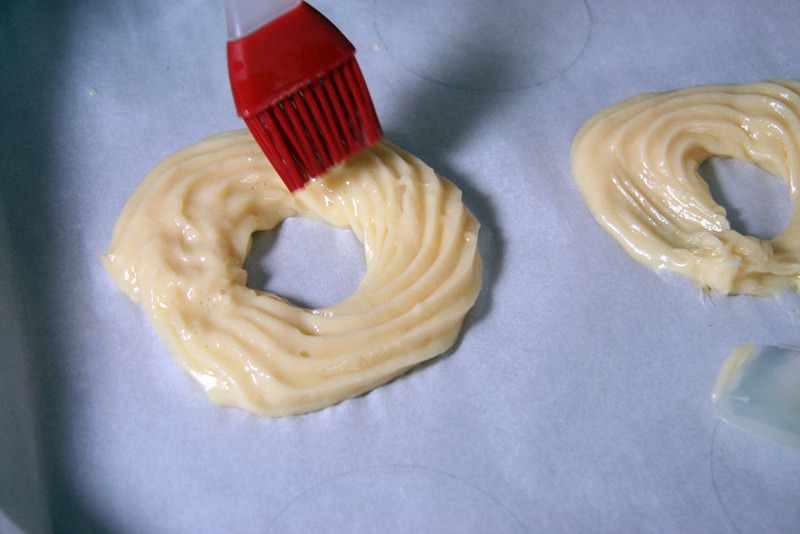 Following your template, pipe the choux pastry into circles. Ensure that the two ends meet by overlapping them. 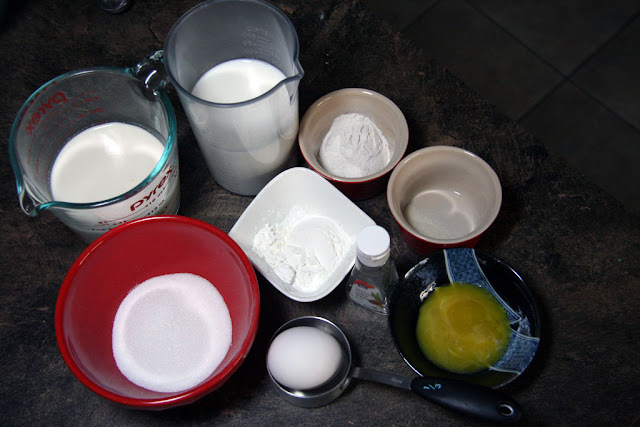 Mix together the egg white with some water to make an egg wash. Lightly brush all of the piped Paris Brests with the egg wash including the inside and sides. 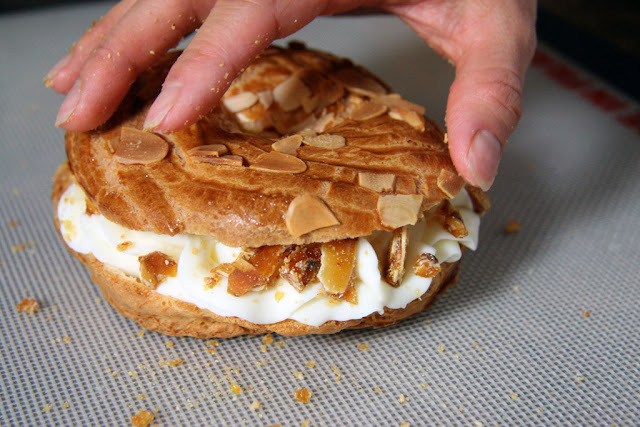 Top all the Paris Brests with the sliced almonds. I ended up piping 7 small Paris Brests with the amount of batter that was made. Bake the Paris Brests in the oven at 375F for about 1 hour or until they are golden brown. Once they are golden brown, turn off the oven, crack the oven door a bit, and allow them to dry out for another 30-45 minutes. Be careful when opening the door of the oven as there is a lot of steam generated during the baking process. You might also need to let these Paris Brests dry out longer than 45 minutes depending on the humidity in your kitchen. 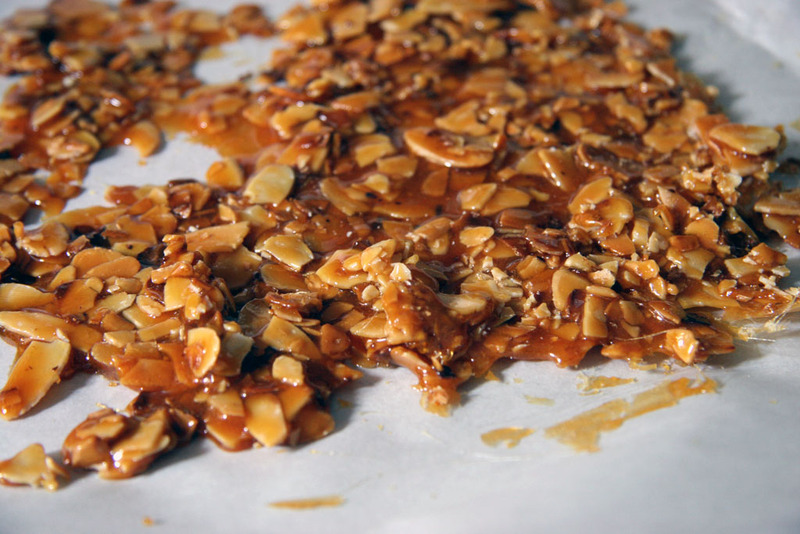 Crush the almond praline by wrapping up the parchment paper and crushing the pieces together. For any pieces that are too big, break them apart with your fingers. 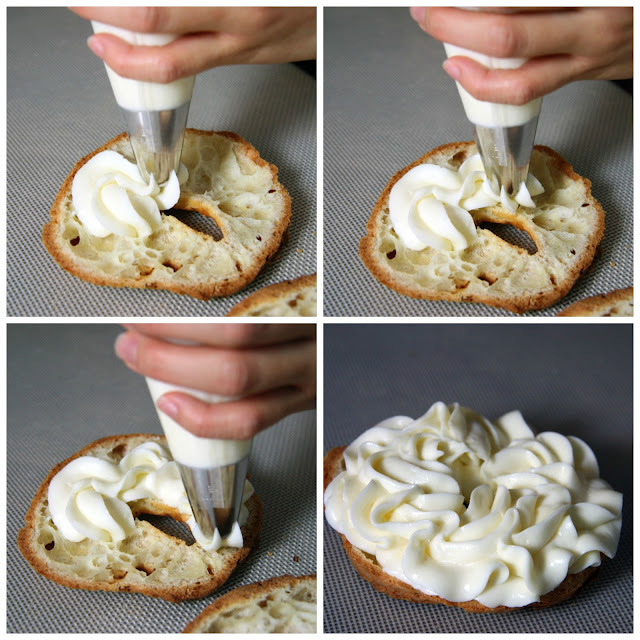 Using a knife, carefully cut each Paris Brest in half (lengthwise). This is similar to cutting a bagel. 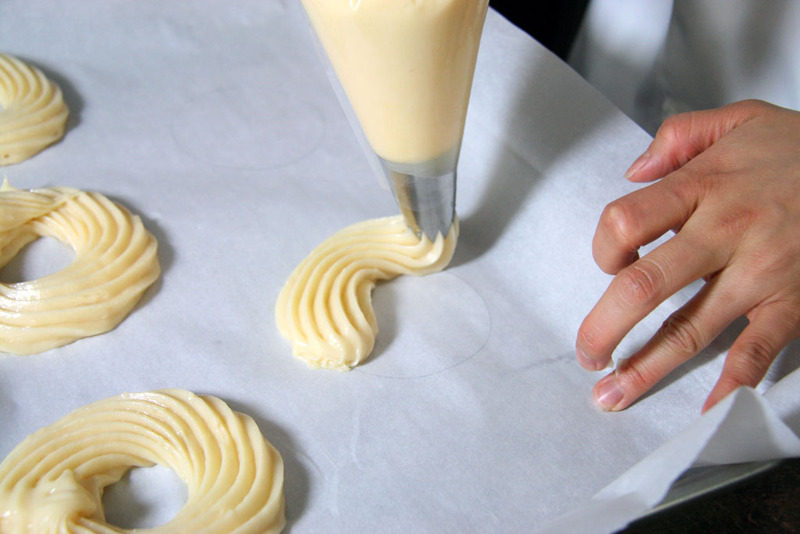 However, the choux pastry is much lighter that you would expect so try not to crush them as you cut. 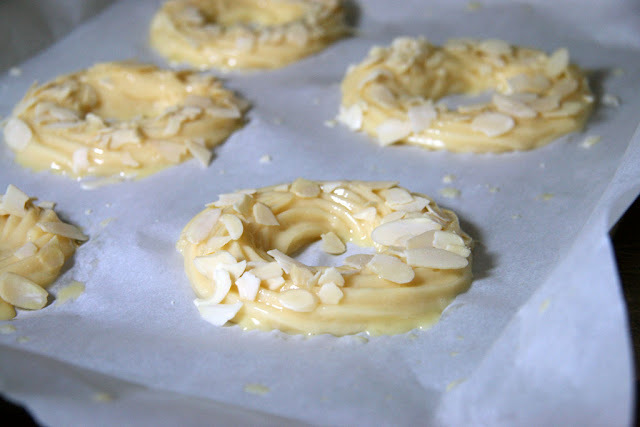 Pipe the almond cream in small loops onto one half of the sliced Paris Brest. There are beautiful air pockets inside the Paris Brests as you pipe. 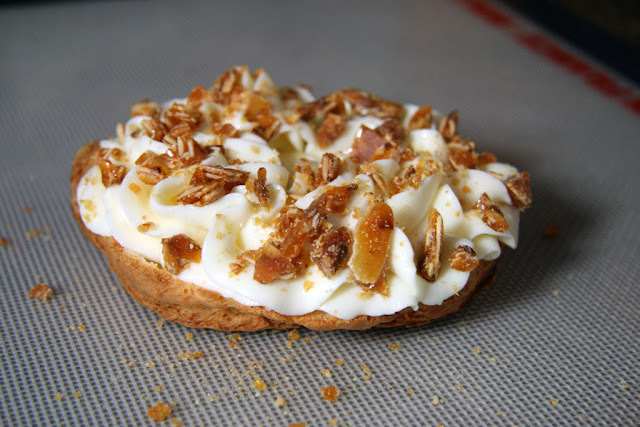 Sprinkle the almond praline on top of the cream. Add the top of the Paris Brest and voila, you are done! 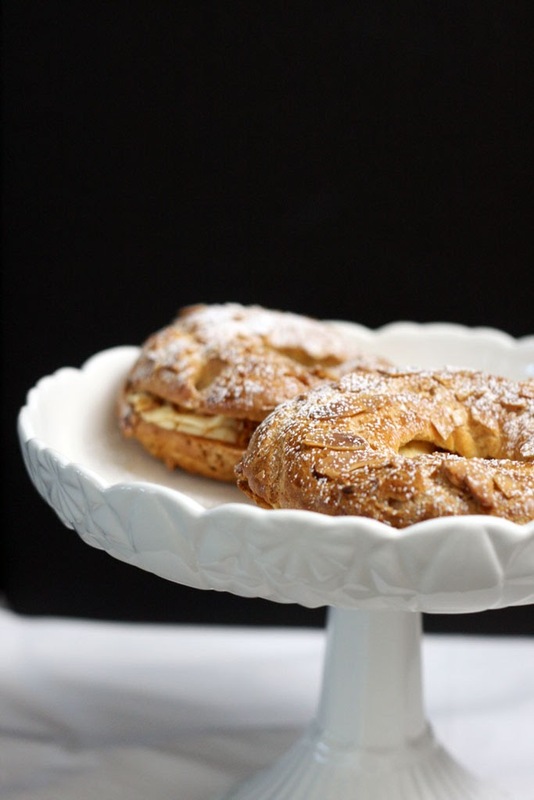 Place the Paris Brests in the fridge for up to two hours prior to eating. Lightly dust the tops of the Paris Brests with icing sugar before serving. Seeing that this is my first time baking Paris Brests, I found Ricardo's recipe to be fairly easy to follow. 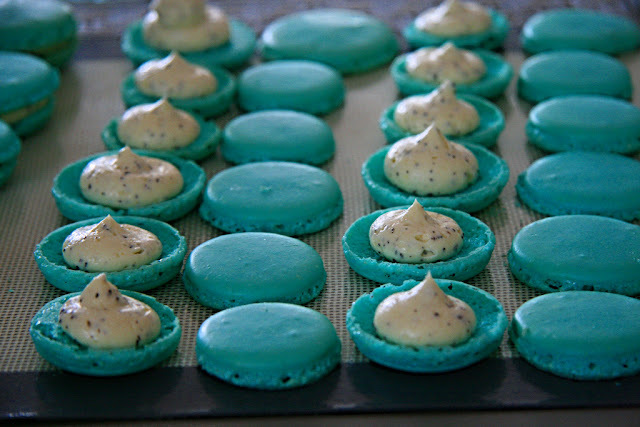 Also, there is way less uncertainty compared to baking macarons. I did substitute almond extract for amaretto when making this recipe - though probably added a touch too much! So, for future reference put in half a tablespoon of almond extract if you choose to make the same substitution. 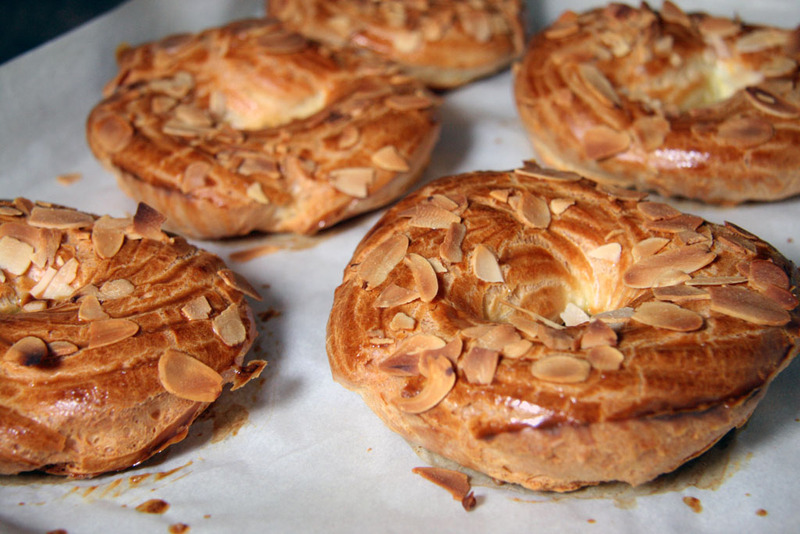 In terms of taste, these Paris Brests taste pretty much as good as they look! As you pop a piece into your mouth you will find that they taste light and fluffy due to the almond cream with crunchy bits of praline. Delicious! The original recipe calls for making one big 8 inch (20 cm) ring. If you want to serve the Paris Brests at a party and ultimately impress your guests, then I would certainly recommend doing so! Think about how impressive this would be? 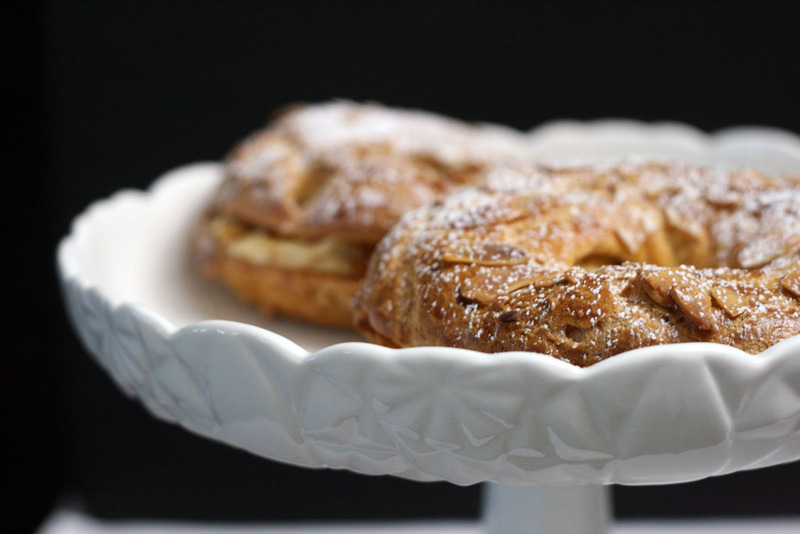 On the other hand, you can like I did in this post, make smaller Paris Brests to enjoy at home or to bring to occasions throughout this holiday season. Thanks Janice!! Yes, I am so happy how they turned out; though with that one modification for the praline. Next time I will try baking a big one! Yes! So happy how they turned out! Next time I will have to try baking a big one and likely also get myself some amaretto. aww thanks Amy! I DO love these paris brest! I will have to check out this cafe the next time I am home. maybe this summer? aw..thanks Phil! It was honestly my first time making them. dan LOVES the ones from Duchess as well. We usually cut just get Paris Brests instead of cake. In the coming months I hope to do a bake the Duchess one too so I can compare. Plus the Duchess one has roasted hazelnuts! So darn good!